I general I love OXO products. I have several of them around the house. I am thrilled that a company focuses on making products that are easy to use and hold. That's doubly true when it comes to products that need to be used in the ice and snow. 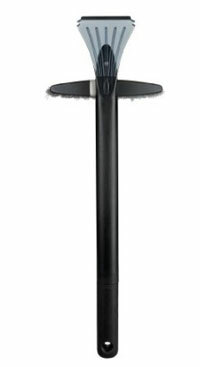 The OXO Good Grips Twister Snow Brush is about two feet long. The brush on the end of its head rotates 90 degrees and "locks" into position. So you can use it lengthwise or cross-wise depending on what you are trying to brush. The bristles are gentle, which is good. They won't scratch the car's finish. At two feet, it's just the right length to go just past the midway point on my Subaru Forester windshield. If someone had a massive hood it might not quite reach. We like it best in the cross-wise position. You can push and pull the snow fairly easily. One minor down side is that the bristles, as mentioned, are soft. So the times that you have to "wham the brush into the snow" to create a starting position, the bristles don't do that very well. Also they tend to "collect" the snow, not shed it. So the brush ends up looking fluffy and white fairly quickly. You then have to whack out the snow to do another pass. I'm in my 40s and live in New England, so I've gone through many, many snow brushes over the years. This is definitely far better than most of the ones I've tried. I do think I'll still need the stiffer brushed brush in the car for the times I need to break through a thicker layer of snow to get things started, but that's OK. In general I appreciate this brush immensely. I was provided a review copy of this brush from the Amazon vine system.